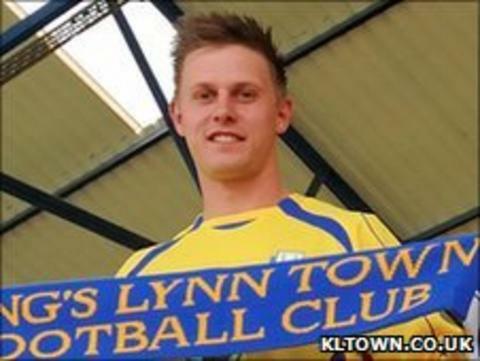 King's Lynn Town have brought in Ridgeons Premier League top scorer Danny Beaumont from county rivals Dereham Town. The 21-year-old, who netted 29 times in all competitions last season, joins for an undisclosed fee on a two-year deal. The striker grabbed a brace against his new club in Dereham's 4-1 Norfolk Senior Cup final win in May. Meanwhile, forward Chris Bacon has ended his second spell with the Linnets to take a year out of football. Beaumont joins defensive duo Paul Cousins and Stuart Wall as summer arrivals at the United Counties League side, with Cousins joining from Wisbech and Wall leaving Bedford. Midfielder Callum Reed has also opted to switch Wisbech for King's Lynn. Meanwhile Linnets chairman Keith Chapman has moved to distance the club from supporters' group the Blue and Gold Trust. In a letter to the trust Chapman said: "'Among other things there have been unsubstantiated allegations contained on the trust's website that have, and may again in the future, have a detrimental affect upon the club's capacity to secure sponsorship. "It doesn't help that the impression has been created that their website has some official connection to the club which gives it unwarranted credibility. "I believe drawing a visible line between the two parties and making the public aware of their non-affiliation will help limit any future damage." Chapman has requested that the trust hands over the domain name www.thelinnets.co.uk to the club. In a statement the Blue and Gold Trust said: "The trust is today taking advice through Supporters Direct in regards to the club's concerns relating to the website and will reply in confidence to Keith in due course. "We can only reiterate that the trust has no desire or seek to be in dispute or disagreement with the owners of the club but will continue to be an independent voice for supporters of King's Lynn Town FC."